This might go into the "who cares?" 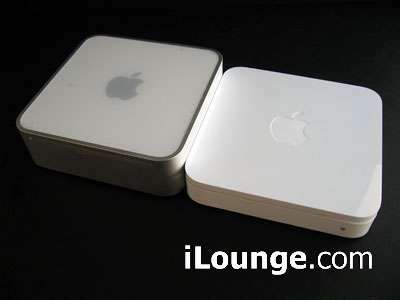 file, but it is interesting to see that the new Airport Extreme has exactly the same footprint as the Mac Mini though the Mini is a little bit taller. The interesting question is whether or not you should stack these devices and if you do stack the devices what device should be on the bottom. Visit the link below for more pictures, including pictures that compare power supply sizes (if you're into that sort of thing). They also have some screenshots and comments about setting up and installing the software for the Extreme. Unfortunately my Extreme won't arrive until the 7th and I won't have time to play with it until the 9th, but rest assured that I will be posting about it once I've had a chance to get it all set up.